Blackdragon's Crafts: De-stempelwinkel DT steampunk valentine trinket box. 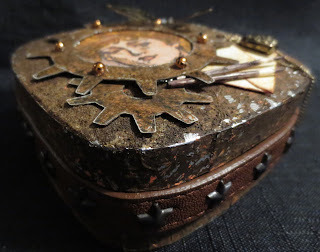 De-stempelwinkel DT steampunk valentine trinket box. This little wooden box has been altered using foil tape, paint and sand to give it a rusted metal look. Totally sensational! Love how authentic your aging looks. What a cool box you have created. Thanks so much for sharing it with us this fortnight at Frilly and Funkie! 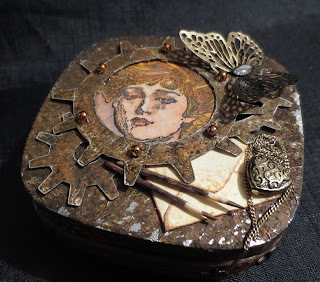 What a totally great and awesome trinket box! I truly love this! foil tape ungh? I have seen that in Micheal's but it always intimidates me. But your use of it suburb!! Totally amazing job here! wow so stunning.really fantastic design and i love your vintage image and details. Well done! Thanks so much for entering at Creative Moments. Amazing alteration this!! All the bits and pieces really make it wonderful!